Home Interviews Interview with Mike “Metal” Mayer of Sin/Fixx! Interview with Mike “Metal” Mayer of Sin/Fixx! BAC: So we have Mr. Mike “Metal” Mayer on the spot today from the band Sin/Fixx. How are you feeling on this fine morning? MMM: Healthy, wealthy & wise lol. BAC: Tell us about Sin/Fixx! How did the madness start and when? MMM: Around 5 years ago… Bailey Kvamme (singer) asked me if I wanted to start a project and I said yes… later on after trying different guitar players… we found Benny… soon after we started writing and landed our first gig at The Phoenix Room in Norfolk. BAC: Right on! What are some of the bands that have inspired you? Do you listen to many different types of music or just “the metal”? MMM: I have a guilty pleasure of listening to all kinds of music, metal mostly, but as a drummer I found myself trying different styles of music. So I can play a vast array of styles. Keeps me on top of my game. Influences range from Slayer to Michael Jackson. I don’t discriminate. BAC: Never know where you’ll find the next piece of inspiration ha ha. So this year Sin/Fixx is once again teaming up with BAC to present SinFest. SinFest 3 to be exact. How did SinFest come about? MMM: Ha ha …it came about by us (Sin/Fixx) wanting to throw the baddest metal show Norfolk has EVER seen. We’ve had two really great years of SinFest, but this year I feel it on the air… IT’S GONNA BE HUGE!!! I’m certain… with the acts we’ve got lined up this year, we’re positive everyone will go home extremely happy!! We have had a lot of great bands every year to which we thank a ton. BAC: F**k’n A, SinFest is always a good time. There is always free beer, how the hell did you guys manage that? MMM: We know a guy, who knows a guy, who has beer lol. BAC: So what type of beer you guys bringing this year? The drinkers wanna know. MMM: If it’s not PBR, I’ll be surprised. I’m hoping anyway. FREE BEER is the BEST BEER lol! BAC: PBR… it’s good stuff! Seems everyone is drinking the blue ribbon of brews. Very American and all. Moving on tell us about your drums. What brand of instruments do you use? MMM: I’m not picky when it comes to brand names. I’ve had a ton of really high dollar drums in my time, but as of now I am playing a PULSE double bass kit, set up Jon Bohnam style. He is a Huge influence. Cymbals stretch from Sabian to Wuhan to Paiste. Whatever the pawn shop has on sale LMAO. I break sh*t too much to buy expensive sh*t all the time, but as long as it holds up under fire… I’m open to all brands!! BAC: Well either way, it sounds good bro. So where is the SinFest 3 after-party ha ha? You know Sin/Fixx brings the party. Plus Norfolk is just built on heavy metal, partying and Johnny Carson. MMM: Well… there most likely will be a party… hint, hint lol. Location yet to be determined lol. All I have to say is, if you wanna after-party come early & stay until it’s over and follow us ha ha! Johnny Carson will make a cameo v.i.a. hologram lol. BAC: FUUUUU****k ha ha, that’s awesome. We’ll it’s been good chatting with you Mike and can’t wait to see Sin/Fixx at the upcoming SinFest 3. Take it easy man and can’t wait to see a ton of crazy f**kers at the show. Have any last words Mike? MMM: SEE YA AT SINFEST 3!! SIN/FIXX FOR LIFE!! THANK YOU ALL & STAY METAL! So there you have it metalheads, free beer and awesome bands. 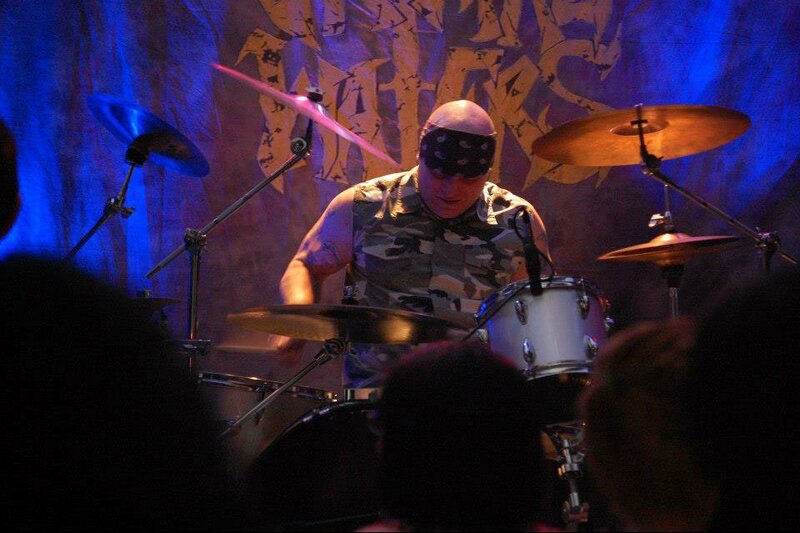 Look for Mike at your local pawn shop shopping for drum hardware and look for a great time at SinFest 3. Next articleInterview with Mr. Vic Giron of Pondstock Festival!